Get ready for an action packed day - Paddle, Trek and Cycle along the River Thames from Windsor to Richmond! Not only a challenge for the body, but our fiendish cryptic team challenges will test the sharpest minds too! This itinerary can also be amended to start from Henley-on-Thames. This unique event will challenge you over 60km starting from Windsor to canoe a stunning section of the river Thames to Old Windsor, where you will experience the vibrancy of one of Europe’s best loved waterways. 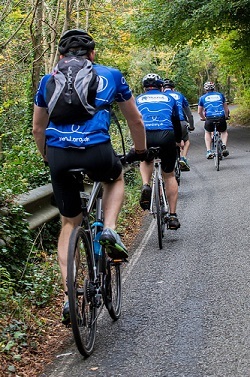 After a rapid teambuilding activity you will set off by pedal power with a scenic detour off the river to pass through Windsor Great Park. Cycle through Staines-upon-Thames, Shepperton, Walton-on-Thames & Mosely in time for a testing initiative task at Hampton Court. 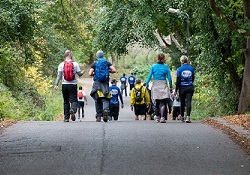 You will complete the challenge on foot, navigating your way through the beautfiul green spaces of Hampton Court Park, Kingston upon Thames & Ham. There will also be some fascinating points of interest to locate on your route! You will finally arrive at Richmond for a well deserved celebration of your quest along the River Thames! What is a Level 3.0 Multi Activity Challenge Like? These challenges are either longer, higher, or span several days. In the case of single day events, you can expect around 8 hours of full on multi activity. In the case of a multi day challenge, you can expect a lower daily duration, but of course the effort is sustained over a longer period. You need to be used to challenging physical exercise for these events, and to enjoy your training, and to do it regularly. Longer duration challenges are likely to be easier in terms of the physical effort, however, you will need to be more resilient due to simple living conditions, i.e. using same clothes for several days, simple food, and maybe camping. This forms an integral part of the challenge. How Fit Do I need to be to join a Level 3.0 ‘Multi Activity Challenge’? You will pack one soft holdall to be transported to the finish location with any emergency change of clothes required ready. You will require a small daysack to carry with you throughout the challenge for your own personal kit. We will provide some small drybags for any essential supplies on the canoe leg. This event is a spring / summer adventure challenge - and typically runs in April to October - weather should be warm (ish) - but at all times you should expect a mixture - be prepared!